It was lights, cameras, action at the Temple Terrace Family Recreation Complex recently as a crew from Fox 13 visited to find out more about pickleball. 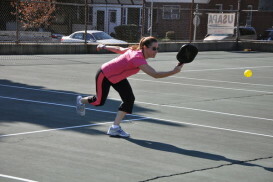 The sport, similar to tennis with some unique distinctions, has become a popular pursuit locally since it was introduced at the recreation center back in January. The news crew spoke with players and instructor Manny Mariani to get a lesson in the game.